Growing up in Detroit my childhood was filled with many visits to the local bakeries owned by Polish families. During certain times of the year, you could get fresh kielbasa sausages and these amazing Polish Dumplings that we call Pierogi. My childhood was filled with enjoying Pierogi, or Polish Dumplings. As a boy, I was lucky because my mom knew how to make pierogi and we didn’t have to wait for the bakery to make them. My family was pretty traditional, and the food was very important to us. For different seasons, we would have different family meals. At Christmas time, we would have a special type of meat pie. That recipe was handed down from my dad’s side. At Easter time, we would have Polish stuffed cabbage. 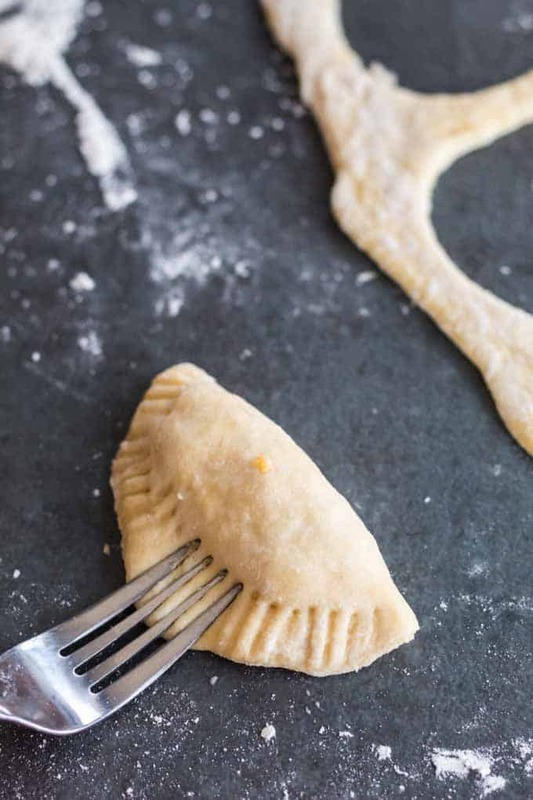 This Polish pierogi recipe freezes well, but don’t expect to have any leftovers. 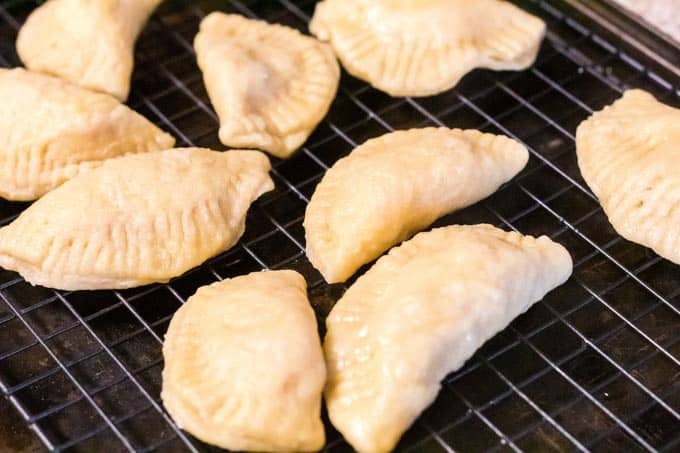 Perhaps more than any other holiday food and during the weeks leading up to Easter, my mom would make this wonderful Lenten treats, Pierogi. If you are one of the unfortunate folks, who might be asking, “What are pierogi?” Grab a napkin and hold on tight. 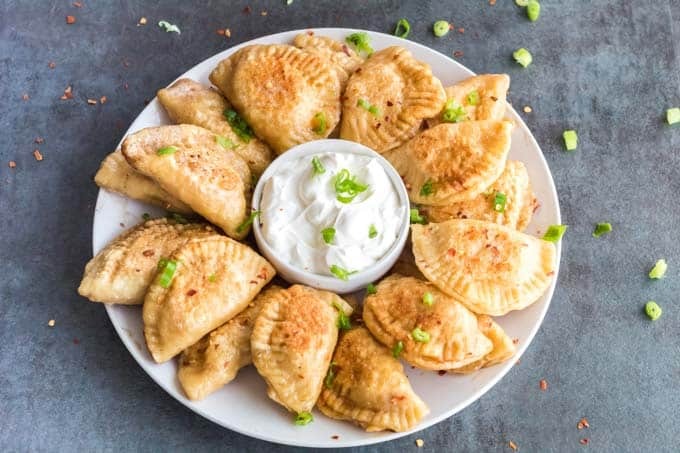 Pierogi is the national dish of Poland, but these dumplings are popular in other countries such as Hungry, the Ukraine, Russia and some Baltic countries. 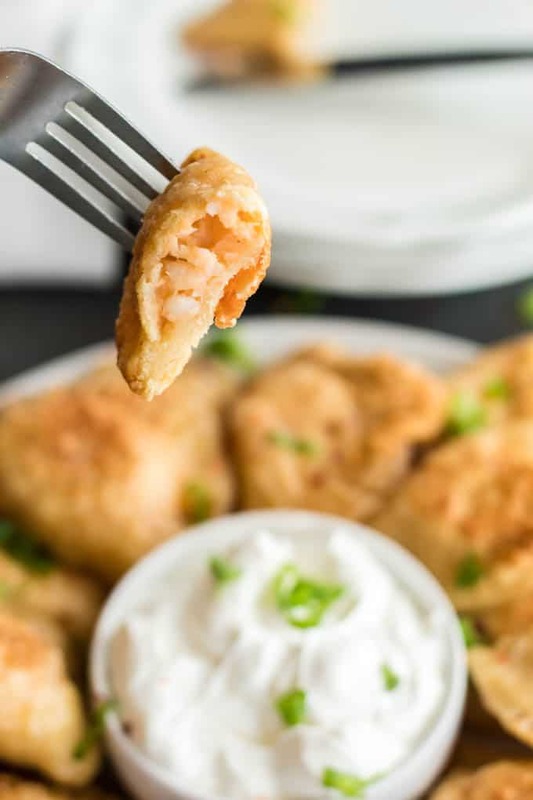 The dumplings can be filled with almost anything, but in Poland, the traditional filling is made of a combination of potatoe and farmer’s cheese. 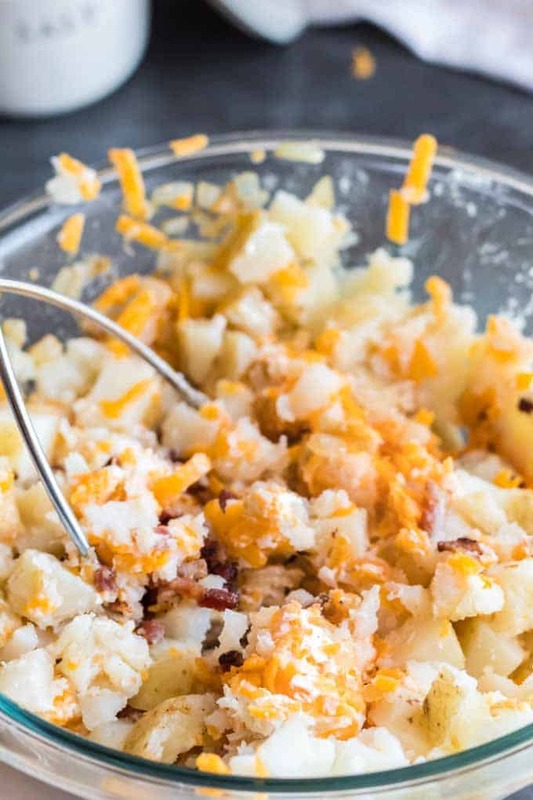 Our pierogi filling uses a combination of potato, cheese, bacon, and onion. This is my family recipe for pierogi, and it’s how my mom always makes it and how her mom taught her to make pierogi. Commonly in our household, my mom would stuff them with a potato and cheese filling. However, they can also be stuffed with sauerkraut or cabbage, a meat mixture, or even be turned into a sweet treat, by filling them with a plum or prune mixture. If you were to ask any of my siblings, I am certain that their favorite, as well as mine, would be the potato and cheese filling. I’m hoping this list of ingredients for pierogi filling has caught your attention. For the pierogi filling, the potatoes are boiled in salt water and then they are combined and mixed with the other savory ingredients. The pierogi filling will be hot, and so while it is cooling, you can get starting with making the pierogi dough recipe. 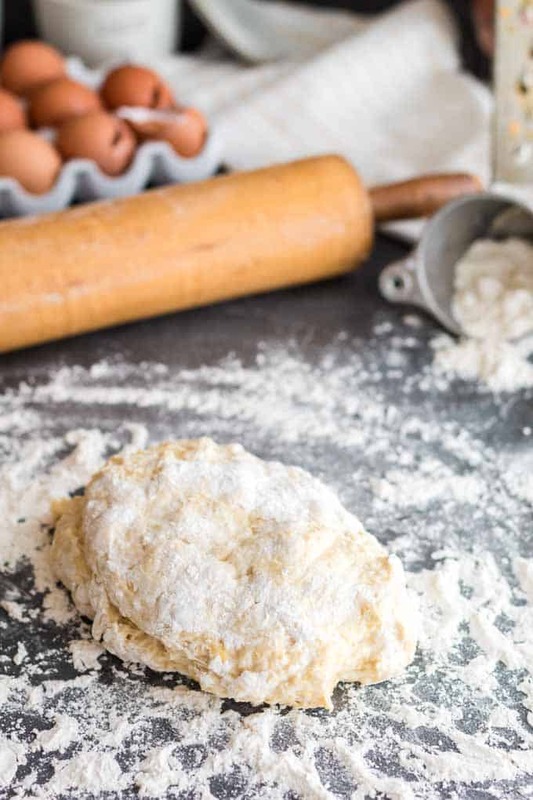 Our pierogi dough recipe is mostly flour and eggs, with a dollop of sour cream. You’re going to mix the pierogi dough until it comes together, adding a bit more milk or water if necessary. Once you have a nice ball of pierogi dough, wrap it up and allow it to chill in the refrigerator for a half hour or so. If you are tempted to try some of the pierogi filling at this point, go for it. We don’t judge. Meanwhile, you can start to roll the pierogi filling into half inch to 2 inch-size balls. Things really start to turn delicious as this point. Roll out the pierogi dough on a lightly floured surface. 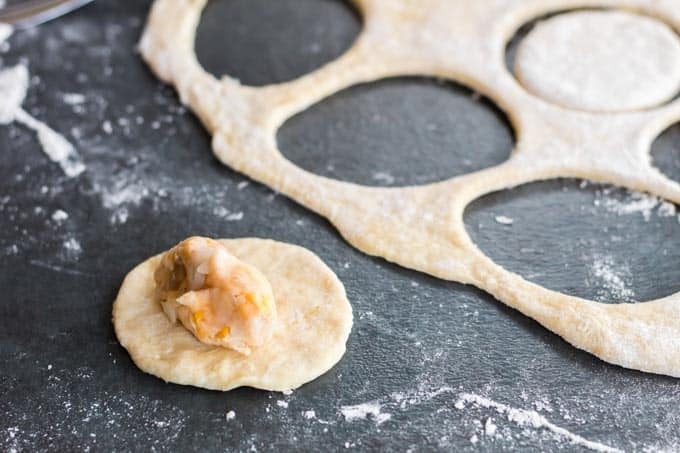 While you are rolling out the pierogi dough, you’re looking for a little elasticity in the dough; you want it to spring back a bit while as you roll it out. Roll the pierogi dough to about 3/4 inch thickness. I like to use a drinking glass, maybe three or four inches in diameter, to cut out the pierogi dough. It should be about 3/4 inch thick at this point. Each ball of pierogi filling is placed on a circle of dough. 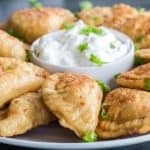 When you place the filling on the dough to make these Polish dumplings, you are going to have to stretch the top edge of the dough to envelop the pierogi filling. You may need just a bit of water on your finger tips to help seal each pierogi tightly. Use a fork to crimp and seal the pierogi. Each dumpling will be a semi-circle at this point and using the tines of a fork to seal each pierogi will give it a nicely uniformed appearance. Scott does a great job of demonstrating and explaining how to make pierogies in the video shown in the recipe card below. Theses Polish dumplings are boiled, like ravioli. As I started to make them for my family, I played around with the filling recipe. Then one day, I took a cue from one of my most favorite side dishes, a twice baked potato. Thus, I began to add bacon, sauteed onions and sour cream to the potato mixture. Allow the pierogi to drain and cool on a rack. They can be wrapped and frozen at this point to enjoy later. 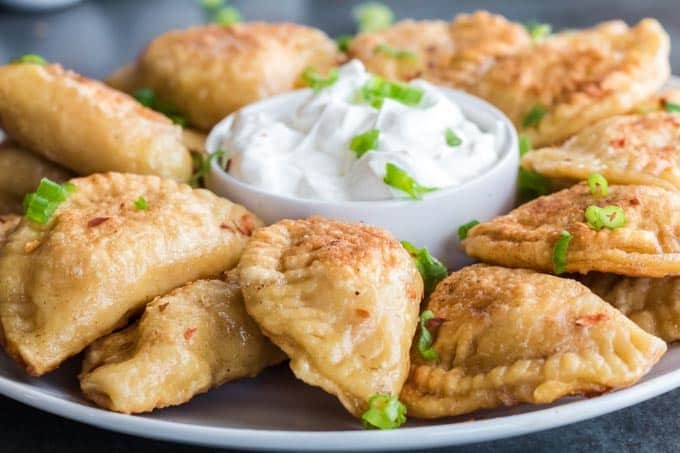 For those of you that have never tasted a Polish pierogi recipe, let me start by saying they are delicious. The best way I can describe them is a Polish ravioli. Usually, these are served on meatless Fridays during Lent. Pierogi can be filled with a wide variety of things. Brown the pierogi in some hot butter, just before serving. 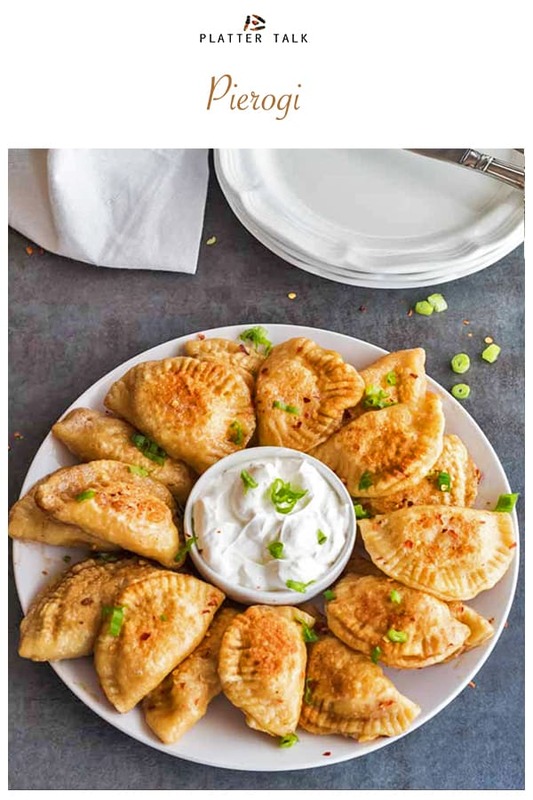 Let me tell you, once you fill the pierogi dough with this flavorful mixture, and then you fry them up and add a dollop of sour cream; you are in heaven. 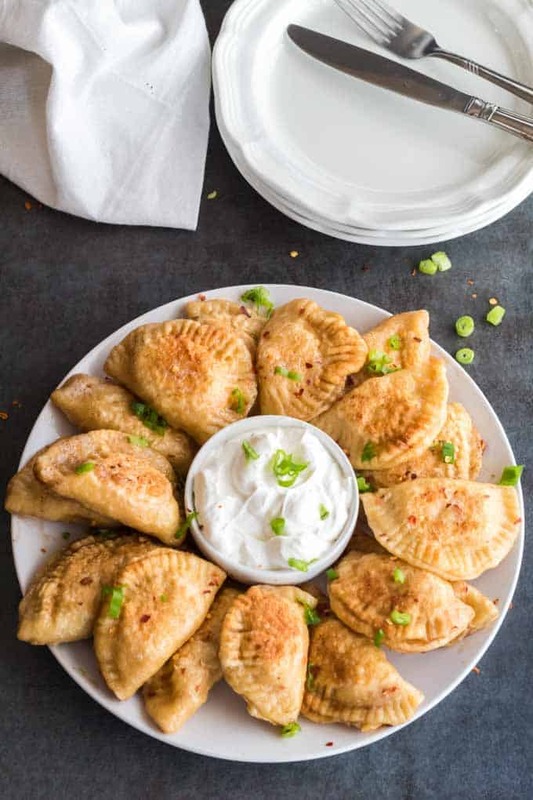 This Polish Pierogi Recipe is garnished with sour cream and chives. For those of you that decide to make this for Lent, simply omit the bacon. You will still have a wonderfully delicious Pierogi. Pierogi are always served around Easter in our family. 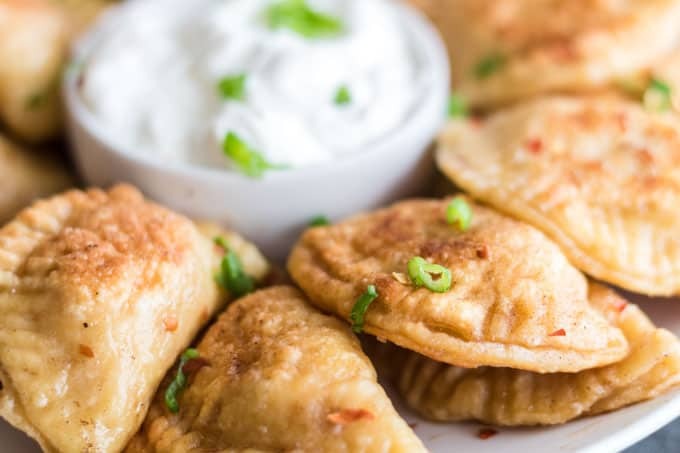 Pierogi make a great side dish, or even a meal on to their own. When you make these, I would suggest making a large batch. Pierogies freeze well for a future meal. That said, I can almost guarantee that they probably won’t last that long. When I make them, the kids go wild. It is not uncommon for each boy to eat 3…4…5. I think the record is 10. Please give these Polish dumplings a try. Your family will thank you! Using bits of chopped bacon, we add a modern twist to this Polish Pierogi Recipe. Make a pierogi filling using a mixture of mashed potatoes and cheese. 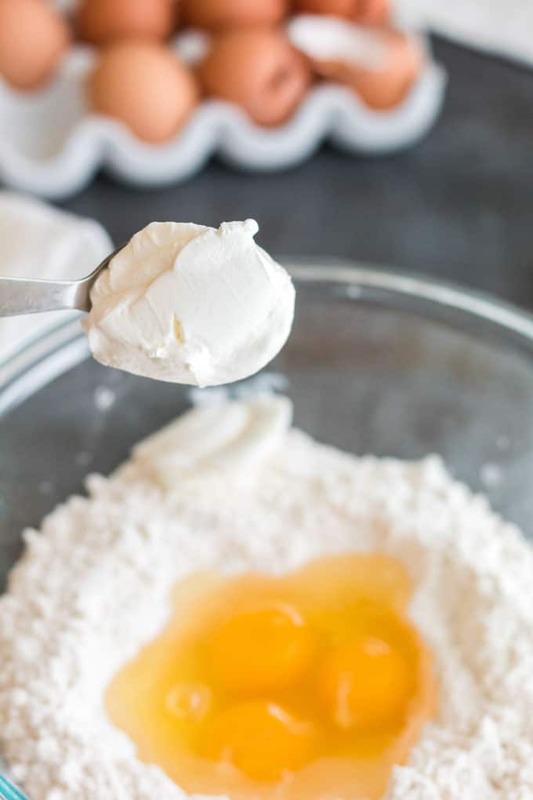 Make the pierogi dough, using flour, egg, salt, and some sour cream. Roll the pierogi dough out and fill and seal each portion with the pierogi filling. Boil each pierogi in some salted water. Drain the pierogi when they are completely cooked. 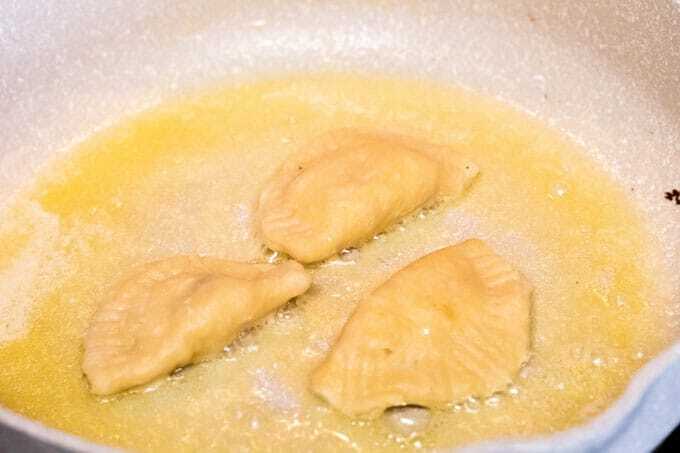 Use a pan to brown the finished pierogi and serve with sour cream. See this reicpe and many more on Meal Plan Monday! 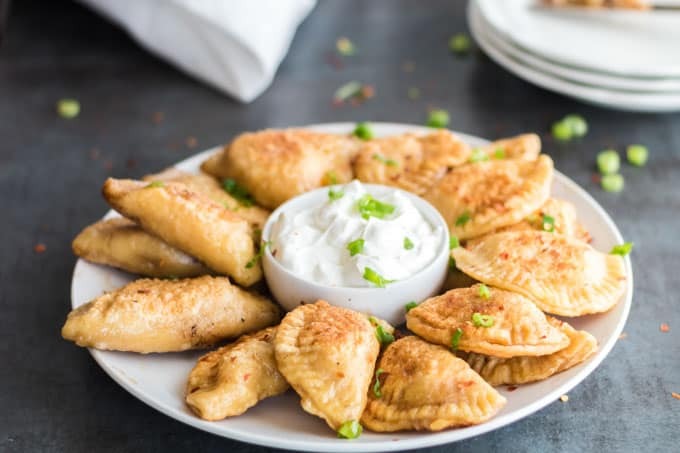 These Polish dumplings are authentic Polish Pierogi that you can make in your kitchen at home! While the potatoes are cooking, saute the onions in a fry pan using a little butter and some of the drippings from the bacon. You want the onions to brown and caramelized. Drain water from the cooked potatoes and use a potato masher to mash them. Add the cheddar cheese, cream cheese. Then, mix together until the cheese is fully melted and set aside until cooled. 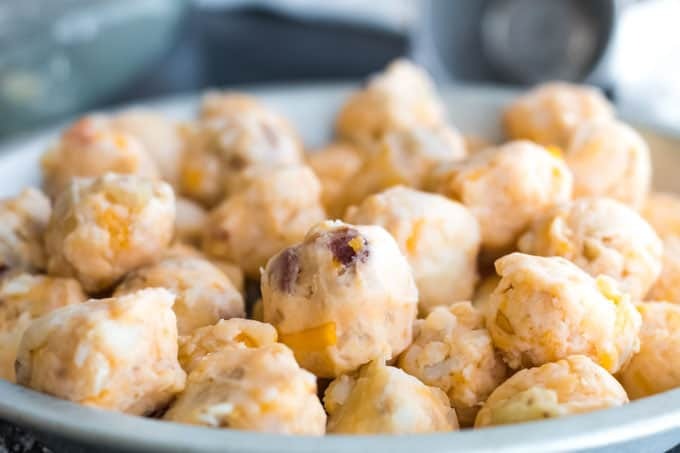 Once cooled, form the cheese and potato mixture into 1/2 to 2 inch balls. While the potato mixture is cooling begin to make the dough. In a mixing bowl, add the flour, eggs, salt, and sour cream. Using a fork, stir the ingredients together. You will want to use your hands at some point to fully incorporate the ingredients. The dough should start to come together. If it does not, add a little more sour cream or a little milk. Once it begins to come together, place on a floured surface and kneed the dough until it comes completely together. Wrap the dough in some plastic wrap and place in the refrigerator and allow to rest for at least 30 minutes to an hour. FYI: Dough should be somewhat elastic while you are rolling it out. This means that it should spring back as you are rolling it out into a circle. 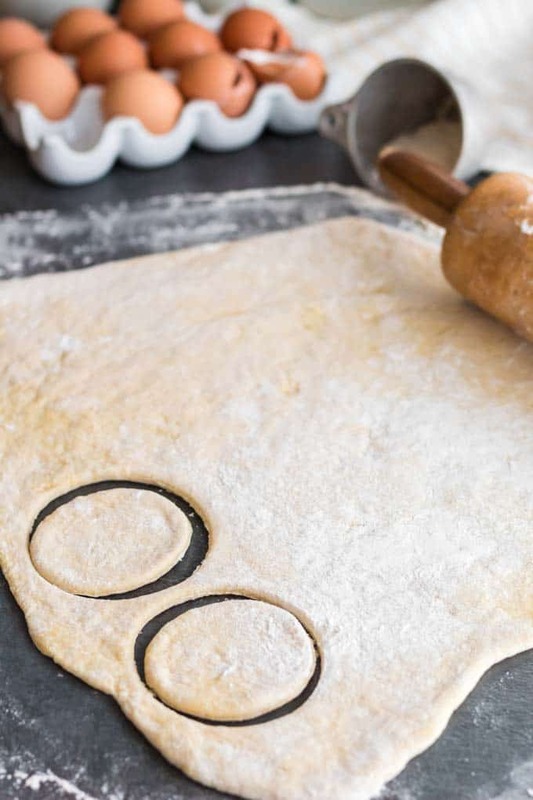 Use a drinking glass to cut circles out of the dough. Place your filing ball in the center of the dough and Fold the dough over the filling. You will need to stretch the dough over to seal. Using your fingers, pinch the dough closed. If the dough does not seal, wet your finger and run your finger on the edge of the dough. This should act as a "glue" to seal your dough. You can also use a back of a fork to help seal your edges. This gives the Pierogi a very nice look. Your finished Pierogi will have a semi-circle appearance. Set aside and continue to make the rest of your Pierogi. Fill a stock pot with salted water and bring to a boil and then add a few Pierogi at a time. 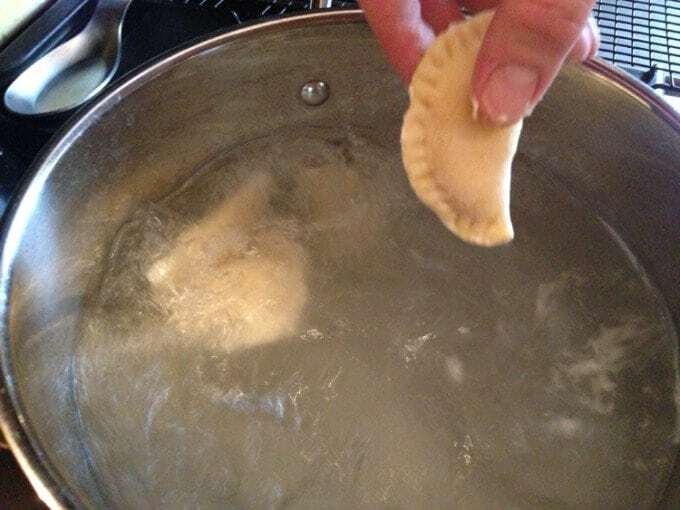 Allow Pierogi to cook in the boiling water until the Pierogi float to the top. This will take a few minutes. Remove from water and place on cooling rack to drain and cool. Continue this process until done with all Pierogi. This looks so great!! This is one of my favorite dishes but I’ve never actually made it myself. Thanks for sharing! 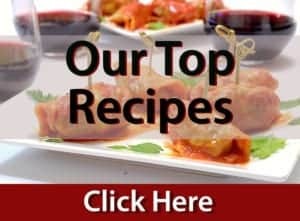 Miranda, our whole family loves this recipe and we hope you try it soon! Sounds like an incredible idea for a cheese. Please let us know how they turn out. 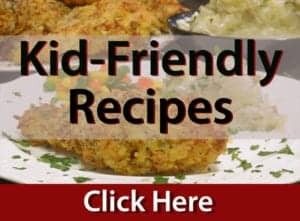 This recipe is our oldest son’s favorite!